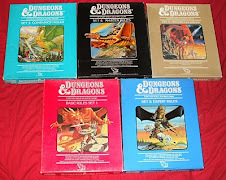 Havards Blackmoor Blog: Did nothing good come out of the D&D movies? Did nothing good come out of the D&D movies? We all know the story. In 2000, Dungeons & Dragons the movie was released, directed by Courtney "Corey" Solomon. The movie suffered from a very poor reception, perhaps especially among D&D fans. Dave Arneson was also to some extent involved with this project. Not that I suggest that the movie's failure had anything to do with him, ofcourse. His role was far too minor to have much impact either way. In retrospect, it seems like this was a poor use of having a man like Arneson on the set. Perhaps instead of consulting him on rules, the director could have asked for creative input? Based on his descriptions from the set Arneson seems to really have enjoyed himself though, spending time with the actors and being given a chance to talk about D&D to both cast and crew. Glad you found a silver lining! Snails, we hardly got the chance to know him. Whenever we break open a keg of hypernerdian ale we pour out the first swig for Snails. Get Blackmoor to your Inbox!